Blizzard conditions with heavy snow and high winds have forced airlines to cancel thousands of flights today. Metro areas from Washington, D.C., to Baltimore, Philadelphia, New York City and Boston are seeing a combination of rain, ice and snow. The snow forecast for New York City has been downgraded to four to eight inches, but six inches of slush and ice coat the runways at LaGuardia, and up to two feet are still expected in New England. The storm is expected to bring wind gusts of up to 40 mph, threatening power outages and coastal flooding. Hubs up and down the East Coast have been affected. American Airlines canceled flights in Philadelphia, Washington, D.C. and Boston. 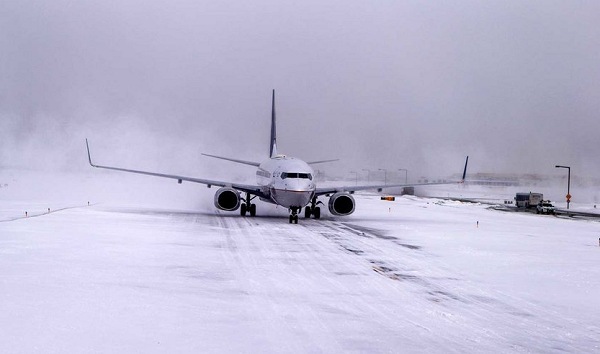 United Airlines canceled all Boston flights after 9 a.m. Southwest Airlines canceled 1,333 flights, many of those in and out Baltimore, Boston, Washington, D.C., New York and Philadelphia, while Delta Air Lines canceled 800 flights Tuesday for New York, Boston and other northeast airports. Orlando International Airport’s website showed more than 55 flights canceled Tuesday morning, and more than 160 flights headed in and out of Charlotte Douglas International Airport have been canceled. Chicago is forecast to receive up to 12 inches of snow and Detroit could be hit with up to 6 inches. Southwest Airlines and American Airlines have had the most flights cancelled today, but JetBlue and Republic Airlines are running just about half their scheduled flights. American Airlines, United Airlines and Southwest Airlines have shut down all Tuesday flight operations in and out of New York City airports. Amtrak canceled Acela service between New York City and Boston, as well as train service between Albany/Rensselaer and Boston, and between Pittsburgh and Washington, D.C.
American Airlines, Delta Air Lines, United Airlines, Southwest Airlines and JetBlue have all issued travel waivers to passengers affected by the storm. They will be able to rebook on another flight without fees. As reported yesterday, the airlines have issued travel change fee waivers for this event.